Parking along Mansfield Dam Drive at the south end of the dam just past the LCRA Mansfield Dam Park entrance is well known to local astronomers. Just keep to the right as you go by the park entrance. 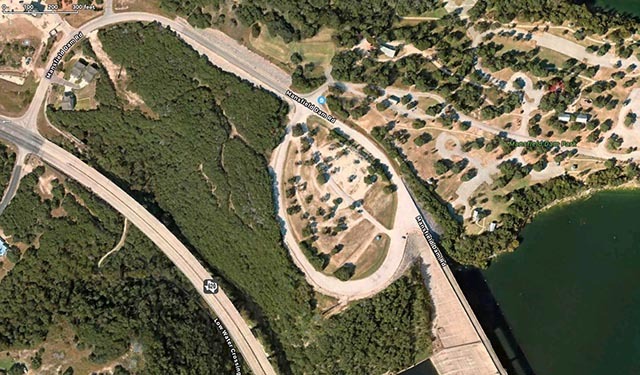 It is the site of the Friday night Dam Star Parties sponsored by the Austin Dam Astronomers. Although the signs mention no parking after 10 PM, there is informal permission from the LCRA and Travis county sheriff deputies to let the astronomers be. You will have observing buddies on nights when the Dam Astronomers meet. For more information or information on whether others will be at the dam check the Dam Astronomers Yahoo group.